This year the prestigious Michael Ramsey Prize for theological writing has gone to David Bentley Hart for his book Atheist Delusions: The Christian Revolution and Its Fashionable Enemies (Yale University Press). 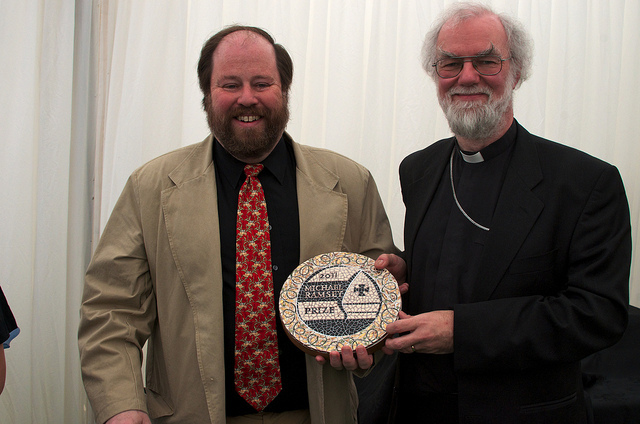 The £10,000 prize was awarded today by Rowan Williams. This book takes no prisoners in its response to fashionable criticisms of Christianity. But what makes it more than just another contribution to controversy is the way he shows how the most treasured principles and values of compassionate humanism are rooted in the detail of Christian doctrine. I am pleased that we have identified a prize winning book that is so distinctive in its voice. It is never bland. It will irritate some, but it will also challenge and inspire readers inside and outside the church. No one could pretend after reading this that Christian theology was lacking in intellectual and imaginative force or in relevance to the contemporary world. It's true: Hart is an extraordinary prose stylist and a brilliant controversialist. He's a unique voice in contemporary theology. Grumpy, elegant, outrageous, and delightful – often all at the same time. Though this isn't my favourite of his books – I don't think it's as good as The Doors of the Sea, for example – it's great to see his writing recognised in this way. Has anyone read that last one by Robert Hughes? It sounds really impressive, but I haven't got a copy yet. If anyone has read it, I'd love to know what you thought of it.